April 14, 2012 By This post may contain affiliate links. Celebrate Earth Day by making these Chocolate Popcorn Trees! They are so simple to make and are great projects for your kids to join in on making! Our world has changed so much in just my lifetime and sadly not for the better in a lot of ways. We’ve made human life easier through industrialization, but more detrimental to the planet we live on. I heard recently that it is estimated that 1000 dolphins and whales are killed in fishing nets every day. Millions of other sea creatures are dying or having their health effected by the Great Pacific Garbage Patch, an enormous pile of swirling trash in the ocean. According to a New York Times article it is estimated to be twice the size of Texas. It’s awful! I have become very conscious of the things I do that have a real impact on our planet and have made many changes; I recycle, use fabric shopping bags, drive a hybrid car, buy energy efficient appliances, use only florescent or led light bulbs, compost our food waste, grow vegetables and fruits in our yard, and have even been known to pick up litter while taking a walk on the beach. My husband and I are constantly looking for ways to make our lives more environmentally friendly. I’m not perfect; I like my air conditioning way too much to give it up, use too many paper towels, and package my chocolates in cellophane bags – but I’m trying. Taking time with nature is a vital part of my life. I love to hike, walk my dogs, and ride my bike along the river. Just sitting on my front porch is one of my favorite things to do. My neighbors across the street all have beautiful flowers and trees for us to look at while we just relax and enjoy the fresh air. To celebrate the warm porch sitting weather, the new life of spring, and Earth Day, I created some chocolate trees topped with white chocolate popcorn leaves. Some even are adorned with candy fruit. Before you begin If you don’t have much experience working with confectionery coating/candy melts, you might want to read my Chocolate Making Tips. *The amount of each of these ingredients will depend on the size and quantity of your trees. 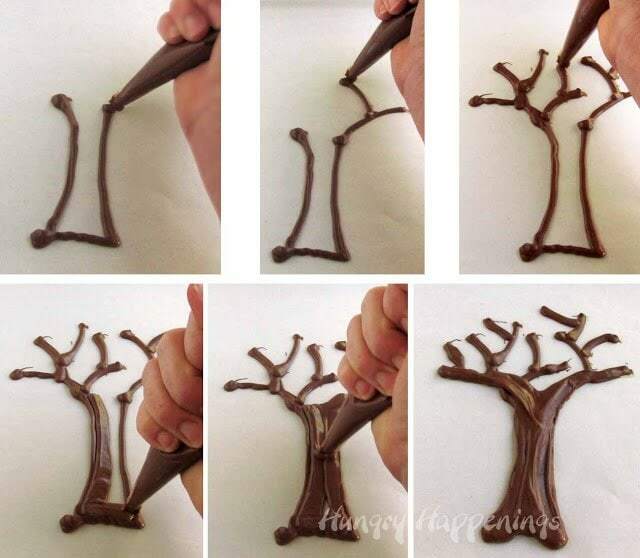 I used 6 ounces of the light cocoa candy melts to make the trunks and branches of my 5 trees. I mixed 10 ounces of green candy melts with 6 cups of popped popcorn for the leaves. Line baking sheets with parchment or wax paper. Pour melted light cocoa candy melts into a disposable pastry bag or zip top bag. Pipe a tree trunk with branches onto the parchment paper. Refrigerate for 3-5 minutes, just until hardened. Continue to pipe trees until you have the desired number of trees. Pour popped popcorn into a large mixing bowl. Pour melted green candy coating over popcorn and stir and toss until well combined. 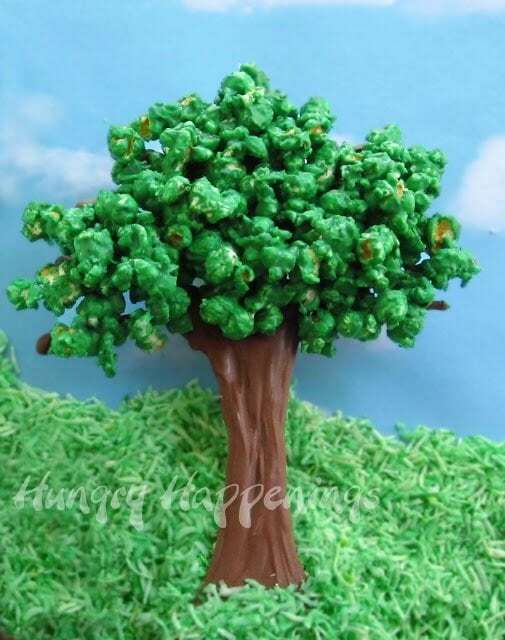 Immediately spoon green popcorn over the branches of your trees. If you don’t work quickly, and the popcorn hardens in the bowl, heat it in the microwave for 10 seconds, then stir. Heat more if needed. 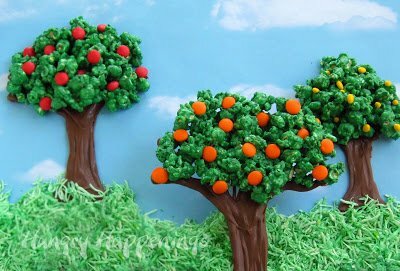 While the popcorn is still wet, add colored candy pieces to create fruit trees if desired. Refrigerate your trees for about 5 minutes until hardened. I used yellow candy coated sunflower seeds to make lemon trees, and jumbo candy buttons to make the apples and oranges. You could use M&M’s, Reese’s Pieces, confetti decorations, or even make your own using candy melts. 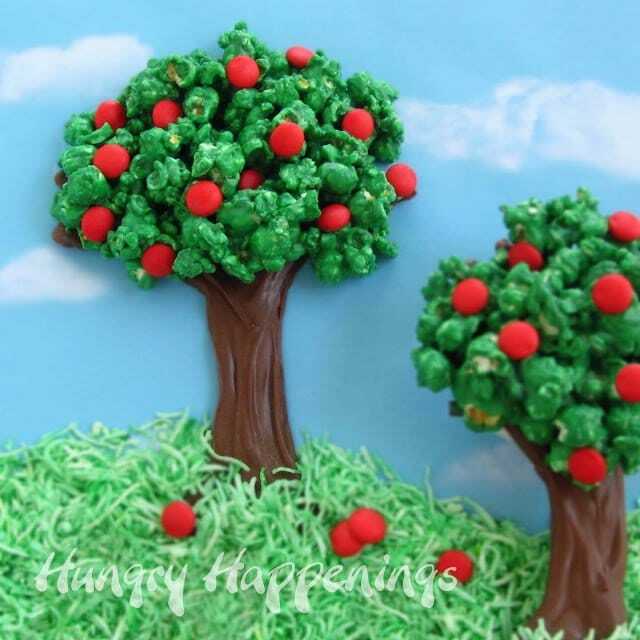 You can make your trees more sturdy by turning them over and piping chocolate on the back of the tree trunk and adding more popcorn to the backside too. Note: To create the grass in my scene, I colored coconut using green food coloring. 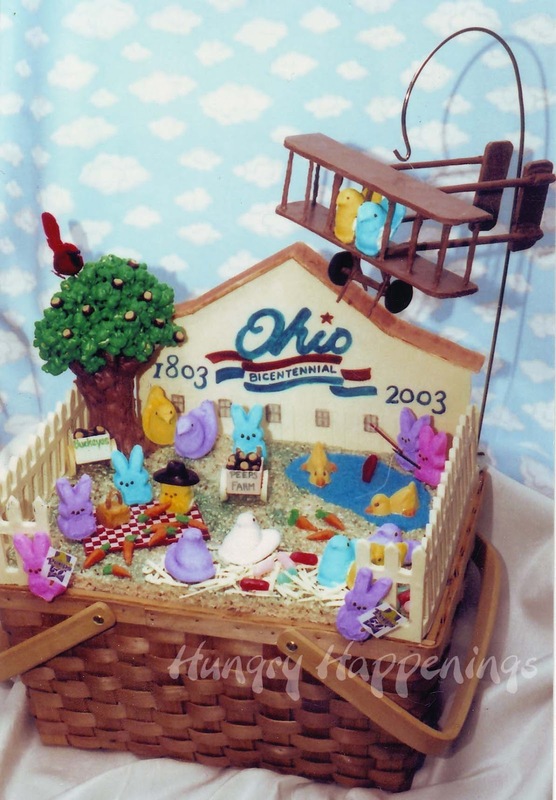 In 2003, I created my first chocolate popcorn tree to be part of a Peeps on the Farm in Ohio basket. Just Born, the maker of Peeps, was hosting a contest asking entrants to use Peeps to create a scene featuring their home state. It was Ohio’s bicentennial and all over the state white barns were painted with the bicentennial logo, so I chose to create a fun day on the farm scene out of chocolate, candy and Peeps. The only things in this entire scene that aren’t edible are the basket, the pole holding the airplane, and the toothpick fishing poles. The buckeye tree, the official state tree, has tiny peanut butter fudge buckeyes sitting among it’s white chocolate popcorn leaves. I didn’t win the $10,000 grand prize, but I did win first prize in my state and received a year’s supply of Peeps – 365 packages of Peeps arrived on my doorstep in several huge boxes. I was passing out Peeps for months. 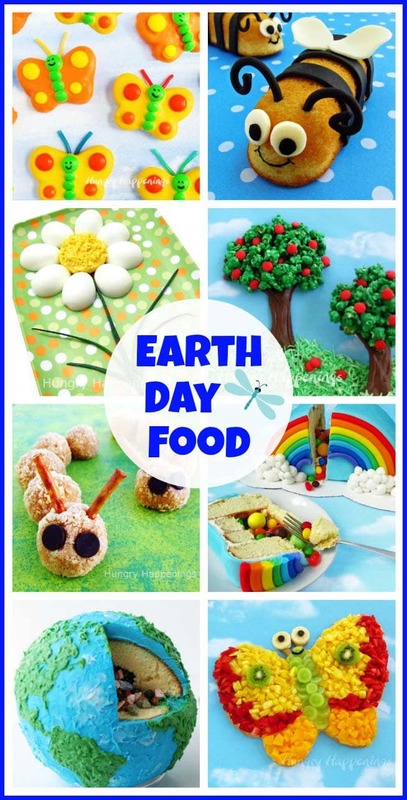 Show Mother Nature how much you appreciate her by making some of these festive Earth Day Recipes. Previous Post: « Add a little sunshine into your day with these cute lollipops. What a great idea! So very impressed once again. Such a cute idea! You have the best ideas! I thought this was a wonderful idea anyway but after seeing the Ohio reference, I fell head over heels. 🙂 Born and bred Ohio country girl here! Thanks Tammy. I've lived in Ohio most of my life. I left for a while but came back because it is home. Your trees are so darn cute and perfect for Earth Day! Those are adorable! I love your creativity and am so glad that I started getting your emails. So cute, Beth! I love your little scene! I can't imagine what the grand prize looked like because yours is amazing! Thanks Sue, the grand prize featured George W. Bush Peeps, so my farmer Peeps were beat out by the President. I worked hard and would have loved to win $10,000 but had a great time creating my edible scene. It was the first time I made a sculptural piece out of chocolate. I stumble upon your web when I was looking for modeling chocolate recipe and I was glad I found your blog. You have fantastic ideas and I was so excited when I saw all your creations. In particular, I love the popcorn trees and the scene you created. To me, it's like an art piece. Btw, I am planning a bunny themed party for my son's 1 year old birthday and would like to create something like yours. Just wondering if you could share the items/ingredients used in creating it? Would be very grateful if you are able to. The popcorn really works perfect for the trees. Love the lemons! Congrats on your prize, you deserved it. Pinning. Okay, these are just amazing. So cute! Pretty! Everyone will fall in love with this and take care of mother Nature once again. You are genius! You do the cutest things!! I've got some little grandkids that would love to do this. I'm going to share it with my daughters. And Beth….don't beat yourself up that you're not doing enough to be green. You are doing an amazing job. If we all did as much as you do then this planet would be a whole lot more greener. It surely does start with each of us. And I didn't even know about that big swirly garbage thing in the ocean. It makes me sick. Thanks for sharing that. Makes me want to do better. PS I wanted to make your darling fuzzy coconut chick cake balls for our Grandkids easter party and my husband even helped with making the little balls (a very healthy no bake recipe) but that and a couple of other things we had to forgoe because of time. I showed your pictures to everyone though. Hi Nann, thanks for all your kind words. I was shocked when I heard about the garbage pile in the ocean. It was the one major thing that made me more aware of the amount of garbage I had been producing. Thank you all! I'm so glad to see people reacting so positively to these chocolate trees.